Your bike is more than just a tool for training; it's an accessory to your lifestyle. You've engineered your life to accommodate your riding, it seems reasonabe to expect the same of your bike components. The 3D+ 110 is a work of engineering founded upon the principles of lightweight and rigid. Crank arms CNC-machined in Spain from aeronautic-grade 7055 aluminum are combined with proprietary technologies to yield cranks with an exceptional stiffness to weight ratio that can handle the dizzying wattage that you'll stomp out on the 3D+. Together with ROTOR's Universal Bottom Bracket (UBB) system, the 3D+ compact crank offers a performance upgrade opportunity for almost all bikes on the market. “MAS” stands for Micro Adjust Spider and means “more” in Spanish. That’s what this technology is all about: more adjustability to further optimize your Q-Rings. Additional bolt holes allow for intermediate positions between a Q-Ring’s existing Optimum Chainring Positions (OCP). A standard crank and Q-Ring combination offers approximately 5 degrees of OCP adjustment. MAS together with Q-Rings offer half positions of approximately 2.5 degrees of OCP adjustment. This means you can micro adjust the orientation of your Q-Rings to fine-tune your pedal performance. 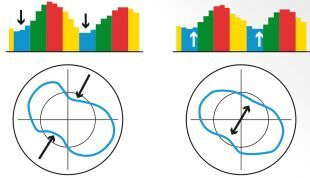 Biomechanical studies indicate that the effort made with Q-Rings becomes a greater performance and pedaling feeling more rounded and smooth due to their ability to make a better use of the strongest muscle groups while they also compensate the dead spot in pedaling. Far from feeling unusual, a Q-Ring feels much rounder than a round ring. A spinscan analysis visualize a cyclists power delivery, with a bar graph indicating the variation from maximum to minimum output and a polar graph showing the rotating shape of the power profile. 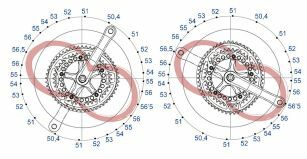 By comparing the left hand Round chainring spinscan and the right hand Q-Ring spinscan below, one can see that Q-Ring graphs are clearly smoother (less variation in torque in the bar graph) and fuller (less of a peanut shape at the weakest point). When one projects a polar plot of a typical spinscan over the varying drivetrain resistance of a 53t Q-Ring during its rotation, the value of a Q-Ring is clearly visible: Maximum power is met with a “56,5t” Time trial sized chainring diameter and minimum power is met with a “50,4” compact size chainring diameter. This variation creates the “perfect spin” we all aspire to, that simply isn’t possible with round chainrings. This is because Q-Rings compensate for the weakest zone of the pedalling stroke and maximize use of the most powerful zone. All Q-ring TT’s were faster, with an average gain of 1.6 sec and 0.7 km/h (1.8%). Please see this article for more detailed information.